Why is Un Ballo in maschera not as popular as the trio of Verdi masterpieces – Rigoletto, Traviata, Trovatore – that, with a couple of digressions, preceded it in the early 1850s? Its music is scarcely less brilliant than theirs, and if its plot is on a par of absurdity with Trovatore’s, it is at least, on the whole, more fun. One problem might be a certain thinness in the portraiture, as if Verdi was more interested in the incidents than in his characters. In his new production for WNO, David Pountney seems to interpret this as a sort of meta-theatricality, an opera watching itself being operatic. Perhaps the best-known fact about Ballo is that Verdi was forced by the Rome censorship to relocate Scribe’s libretto from historical Stockholm, 1792, to a mythical 17th century Boston, and to substitute a Governor for the Swedish king; and this provokes Pountney into a somewhat surrealist critique of the whole concept of kingship. To be more exact, kingship for him is a faded ghost that appears only fleetingly at the very end, when the murder victim isn’t the once-and-no-longer king, Riccardo, at all but a chorus-member togged up as a skeleton with a crown. It would be interesting to know how he explained this to our own future king, who was seated beside him in a stalls box. At other times we might be witnessing not a parody of royalty, so much as a Gilbertian satire on operatic convention itself. The choruses of conspirators, witch’s acolytes, disguised sailors and (at the ball) fancy-dress skeletons all slope around in a ludicrous choreography that recalls nothing so much as The Pirates of Penzance, while the witch Ulrica’s mumbo-jumbo might well have been imported from Ruddigore. The chief conspirators (Jihoon Kim and Tristan Hamilton), dark-voiced and black-cloaked, would be arrested on sight in normal life. Bucket-seats, of a somewhat older vintage than the ones we ourselves are occupying, pop up in ridiculous places: in what can only be described as Ulrica’s waiting-room, and at the gallows, where Amelia’s torments are observed by a sinister audience of conspirators in Davey-lamp wolves heads. All this, I might add, is brilliantly watchable and spectacularly designed by Raymond Bauer (sets), Marie-Jeanne Lecca (costumes) and Fabrice Kebour (lighting). Occasionally one might feel distracted – as often with Pountney – by the need to tease out the significance of this or that image (long ago he read Freud before directing Hansel and Gretel). On the other hand, he remains one of our most musicianly directors, one who knows how to use space to respond to musical movement, so that this most mobile of Verdi’s scores enjoys all the physical vitality it deserves. It also, more excitingly, gets the singing it needs. Outstanding is Mary Elizabeth Williams’s Amelia, a morose, somewhat one-dimensional role with, though, rivetting, difficult, beautiful music over a big range, much exposed in the gallows scene here by placing her a good deal downstage with her back to the horrors (pictured above) . She never puts a foot wrong; this is wonderful Verdi singing. The Riccardo, Gwyn Hughes Jones, is likewise completely on top of his more vivid part, taxed only by the rapid patter of the first act, and occasionally thinning his tone beyond the strictly beautiful in pursuit, I suppose, of the coarser aspects of this fun-loving ex-prince. Roland Wood is impressive in Renato’s two big arias, slightly colourless elsewhere. Julie Martin du Theil sparkles as a punk, leather-clad Oscar. Intriguing how Verdi explores the irony of this Offenbachian intruder on Italian melodrama, so much more successfully, in my view, than with the ghastly Preziosilla in La Forza del destino. Only Sara Fulgoni’s Ulrica disappoints vocally, though we see a lot more of her, from curtain-up onwards, than Verdi decrees, as she wafts in and out from scene to scene, another of those irritating “watcher” or alter ego figures without which it seems that no opera director dares face an audience these days. 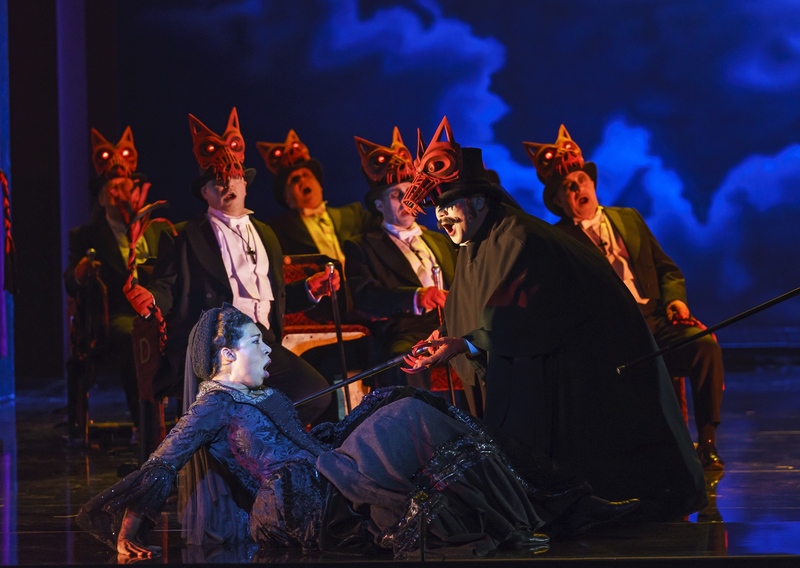 Parodied or not, Ballo is a gift for the WNO chorus, and they seize it with all hands, especially in the irresistible first act, a sort of Fledermaus before the fact. As always, too, the orchestral playing is top class, under the indispensable Carlo Rizzi, who comes with the scenery in Verdi these days, and more than welcome.